The Manager’s objective on behalf of the Fund is to acquire commercial forestry plantations with standing timber, as well as (potentially) land suitable for planting. Plantations will be held during the life of the fund, although in some cases mature timber will be harvested; as trees grow, so does their value (all other things being equal). In addition, however, the Manager will seek to identify and realise opportunities to add value from non-forestry sources. In particular, opportunities to profit from renewable energy generation will be sought out, although other opportunities may also arise, such as carbon offset. This approach has been applied successfully with the Manager’s first venture into forestry, which is benefitting from wind farm exposure as well as its forestry operations. The Manager will maintain relationships with land agents, commercial forestry contractors, corporations requiring land for carbon off-set and certain landowners, with a view to ensuring that opportunities to buy (relatively) large plantations are quickly identified. It will also offer owners of smaller portfolios of forestry land the opportunity to contribute their plantations to the Fund as an in specie contribution in exchange for a corresponding partnership interest. 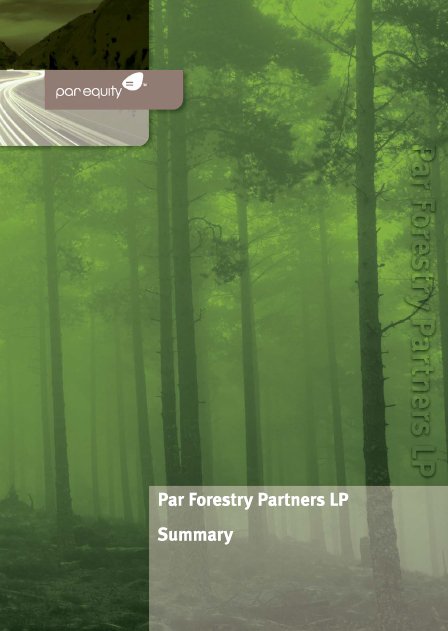 Each potential acquisition will be assessed in terms of acquisition costs, on-going maintenance costs, harvesting costs and so on, as well as in terms of the ultimate sale potential of timber (standing or harvested) and the potential resale value of the land. Alternative and complementary land use potential will also be evaluated. 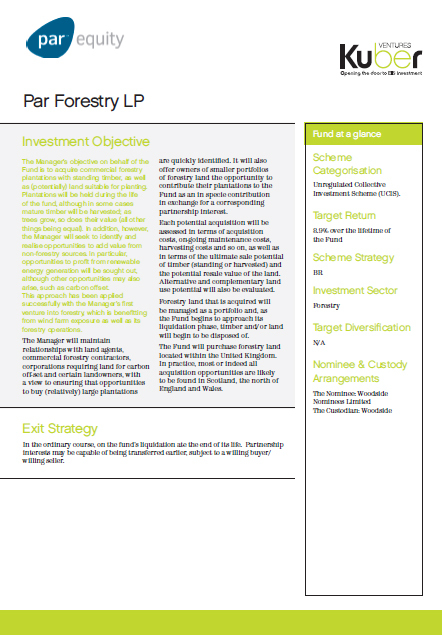 Forestry land that is acquired will be managed as a portfolio and, as the Fund begins to approach its liquidation phase, timber and/or land will begin to be disposed of. The Fund will purchase forestry land located within the United Kingdom. In practice, most or indeed all acquisition opportunities are likely to be found in Scotland, the north of England and Wales. In the ordinary course, on the fund’s liquidation ate the end of its life. Partnership interests may be capable of being transferred earlier, subject to a willing buyer/willing seller. 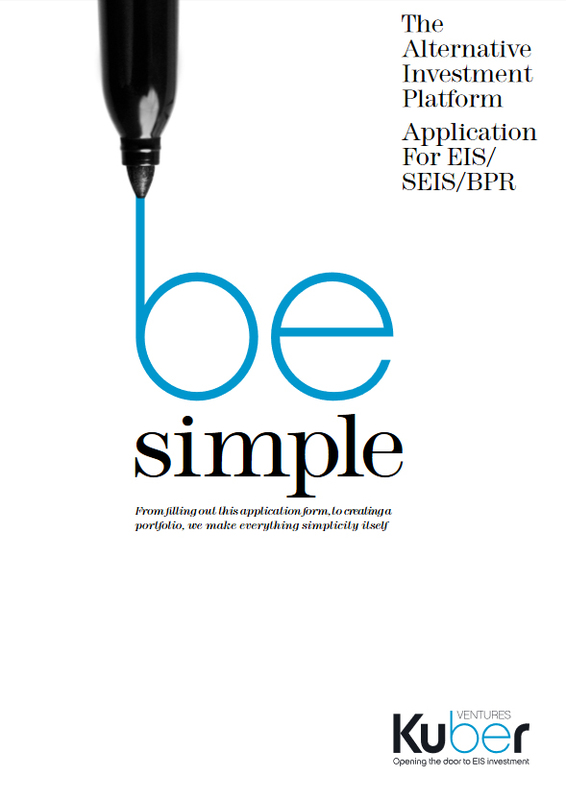 Par Equity is an Edinburgh-based venture capital firm, formed to provide intellectual and financial capital to innovative young companies with high growth potential. Par Equity benefits from a strong flow of investment opportunities, partly because the management of young companies recognize the power of Par Equity’s model to add value and partly because Par Equity operates in the equity gap, where young companies struggle to find finance. The members of the Investment Team have, collectively, a broad range of experience in investment, business management, transaction execution, commercial negotiation, deal structuring, strategy, corporate turnaround and corporate restructuring. They work with the Par Syndicate and the Advisory Panel in evaluating potential investments and have a significant network of professional and personal contacts that they can call on in assessing opportunities. 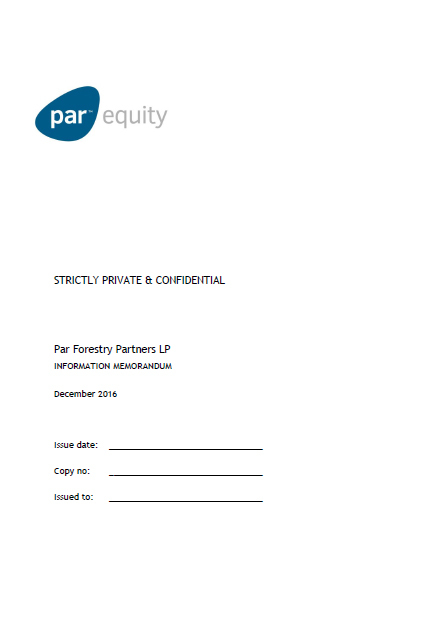 Par’s collaborative model, with the active involvement of a network of investors and other contacts, allows it to access opportunities that may not be available to the general market. a wind down/liquidation fee of 2% of Aggregate Commitments. 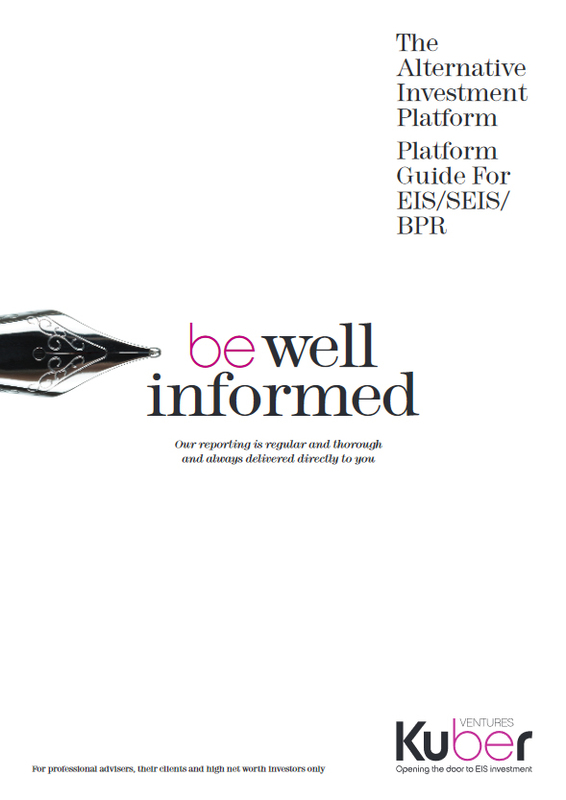 The Fund will also be obliged to meet its other costs and expenses, including the costs of the Operator, audit and legal expenses, as set out in more detail in Part 3 of the Information Memorandum. 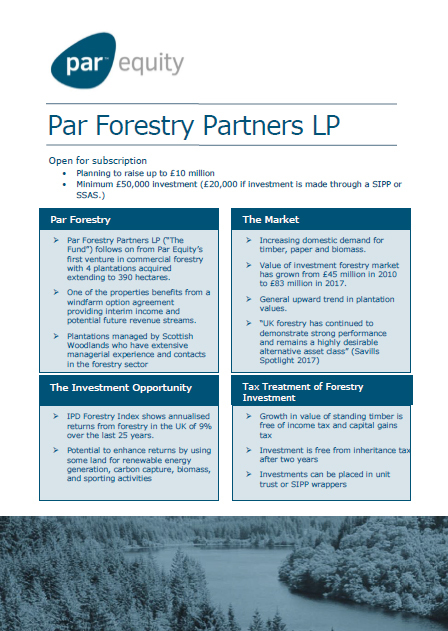 Par Forestry Partners LP is an unregulated collective investment scheme whose promotion in restricted by law only to certain specified types of investor. The Fund is classified as a Non-Mainstream Pooled Investment (“NMPI”) by the Financial Conduct Authority, which imposes similar restrictions on its promotion. This summary is not intended for distribution to members of the public. Promotion of the fund is made by way of an information memorandum (see www.Kuberventures.com) available only to investors eligible to receive it. 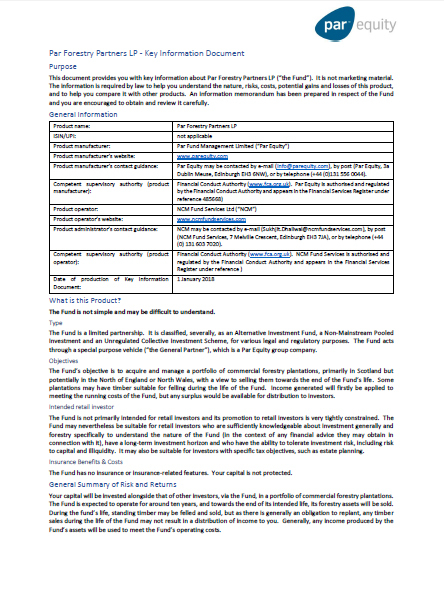 Interests in the Fund are illiquid and any money invested in it is at risk. Past performance is no guide to the future.